There are many problems that can contribute to shedding problems or incomplete sheds, but the most common problem in inadequate humidity levels. Other factors include skin infections, injuries to the skin (including old scars), parasites, malnutrition, and inadequate heating or lighting. For this reason, if incomplete shedding is a problem, it is a good idea to consult with a reptile veterinarian to rule out medical causes. It is always important to make sure you are providing adequate humidity levels to prevent shedding problems, but remember that too much humidity can cause other problems. Find out the ideal humidity for whatever species you are keeping, and get a hygrometer to make sure you are keeping the humidity in the proper range for your reptile. As well, make sure you are providing proper temperature ranges, lighting (e.g. quality UVB lamps for species that need them), and an ideal diet. Snakes generally shed their skins in a complete sheet, starting at the nose and working down to the tail (their skin comes off a bit like a sock being turned inside out as it is removed). When there are problems with shedding, the shed skin is not complete and the skin comes off in patches (and in some areas the skin may not come off at all). Retained eye caps, where the protective scale that covers they eye is not shed with the skin, may also be a problem. For a snake having problems with shedding, you can try soaking the snake in a tub of warm water a few times a day. Make sure the water covers the body but is not too deep or your snake may drown, and supervise your snake during the soak. Wrapping your snake in warm wet towels may also work as the friction from the towels as your snake moves around may help remove the skin; some keepers place snakes with shedding difficulties in a wet cloth bag (such a pillowcase) for a few hours. Providing a humidity hide is also a good way to give a shedding snake access to a higher humidity area. For arboreal snakes, try regularly misting. 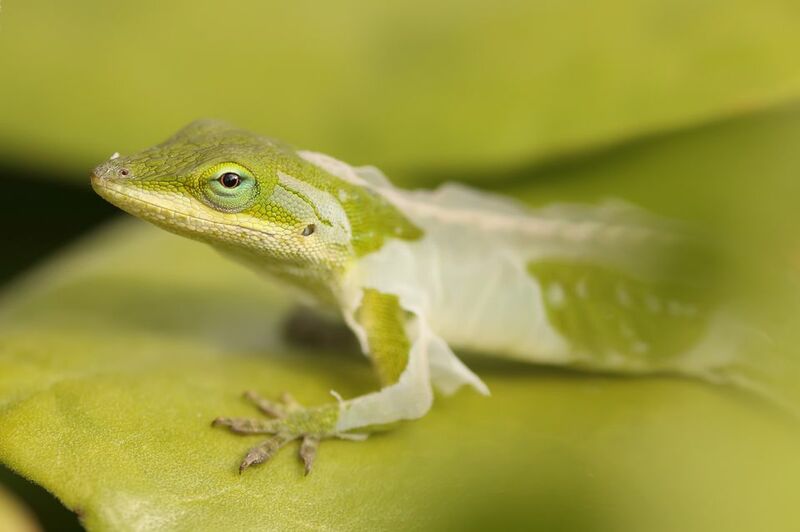 Lizards usually shed their skin in patches, but problems can occur when parts of the skin do not come off during the shed. This can especially be a problem around toes, the tail, and the base of dorsal spines (e.g in iguanas). In these areas, skin that does not come off can dry up and constrict around the toes, tail or spines, and can cause loss of these appendages. Shedding is usually completed within a week or two, and sometimes sheds occur one on top of the other, so sometimes it can be hard to tell whether a shed is progressing normally or not. Generally, all the skin should be shed within a couple of weeks once shedding has begun. For lizards with shedding problems, treatment is much the same as for snakes. Providing a warm soak a few times a day can help. A humidity hide can also be very helpful for some lizards, such as leopard geckos; for others, such as water dragons, try regular misting. Again, make sure the enclosure is kept in the ideal humidity range for the species you are keeping. Bits of skin around the toes, dorsal spines and tail tips may need to be gently massaged off, but be especially careful with the tail as some lizards will just drop their tails as a defense. Turtles shed the skin on their heads, tails and legs. The skin on their bodies is often shed in ragged chunks. For aquatic species, problems with skin shedding are not common. For terrestrial species, soaking or misting is usually sufficient to aid shedding. Aquatic species also shed the outer layer of the scutes on their shells. Retained scutes, where the outer layer of the scute is not shed, can be a problem. Retained scutes are prone to infection and are usually a result of husbandry problems. Particularly, turtles should bask out of the water long enough to dry out their shells (lower the water temperature a bit if your turtle is not coming out to bask). Also, sufficient exposure to UVB light and good nutrition are important in proper shedding of the scutes. If your turtle is retaining scutes, see your reptile vet for advice.